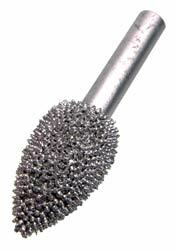 These Carbide Carving Burrs have special conical shaped barbs to cut wood easier than normal burrs. They are perfect for use in any die grinder or flex shaft carver with a 1/4" collet including the Foredom™ and Mastercarver™ flex shaft systems we sell. They can be easily cleaned with a butane torch if they become clogged. We offer two shapes of burr. The 5/8" dia. Flame and the 1" diameter Sphere. Both are good for shaping and carving details. Overall length is 2" including 1/4" dia. shank.